FPGA design tool vendor GateRocket has ceased operations. The GateRocket homepage notifies visitors that the company has ceased operations. 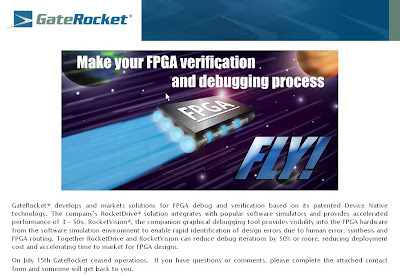 EDA vendor GateRocket, a developer of tools for FPGA debug and verification, has shutdown its business as of July 15th, 2011. According to the former company president and CEO Dave Orecchio, via Twitter, the company simply ran out of capital. The sudden closure comes a little more than a month after GateRocket was an exhibitor at the 2011 Design Automation Conference in June. Visitors to the GateRocket website will find a notice of the closure, but all other web site content has been removed. GateRocket's first product, RocketDrive, was introduced in 2007. RocketDrive accelerated simulation for FPGA design verification by combining hardware and software for "Device Native verification". Designers could place portions of their design onto an FPGA in the RocketDrive, to speed up analysis over standard software simulation alone.The GateRocket technology immediately earned industry recognition, including 2007 top product awards from EDN and Electronic Design magazine. GateRocket followed with RocketVision, a debug and visualization environment to go with RocketDrive that enabled simulators to have full visibility into the FPGA hardware. RocketVision helped designers to determine differences between design intent and FPGA behavior, by automatically inserting test points at any level of the design hierarchy and without requiring additional test pins on the FPGA's I/O. In 2010 GateRocket introduced SoftPatch as a new feature in the RocketVision FPGA debug platform. SoftPatch enabled engineers to patch their FPGA designs with edited RTL (register-transfer level) software blocks, and evaluate the changes with RocketVision before re-running synthesis and place-and-route. With SoftPatch users would simulate the change in standard HDL software while the unchanged portion of the design executed in the native FPGA hardware in the RocketDrive.SoftPatch also earned industry awards, including the DesignVision award for IC Design Tools at the 2011 DesignCon, and nomination for the 2010 EDN Magazine Innovation Award in the EDA tools category. There is no word yet regarding an acquisition of GateRocket's assets, but the tools could be valuable to both Xilinx and Altera should they be interested in picking them up. A form on the GateRocket home page invites visitors to submit questions and comments, and "someone will get back to you".